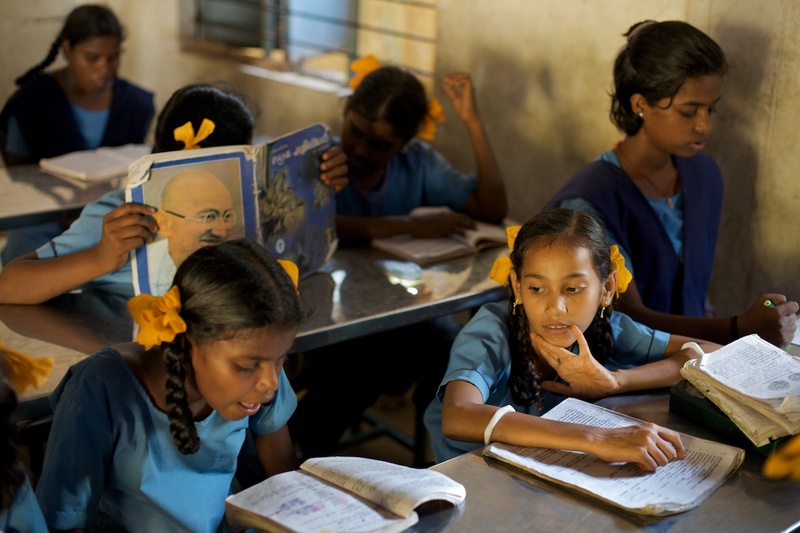 The quality of school education in India varies widely. From the Doon School in the foothills of the Himalayas which teaches the sons of India’s elite to the tens of thousands of dusty government schools that dot India’s rural plains, providing classes in rote-learning for the children of agricultural laborers. The photographs I have just featured in my gallery on south Indian students looks a school in Tamil Nadu that falls very much in the bottom half – though certainly not right at the bottom – of this scale. Most of the teachers I met at this government school in Cuddalore were undoubtedly committed to their pupil’s education. It is not easy being a teacher in tropical south India when the classroom ceiling fans don’t work or where resources are so meagre that students are forced to sit on the floor because there are not enough desks to go around. But it was still depressing to find that the teacher of one class I photographed had simply not bothered to turn up. Instead, a twelve year old girl had been assigned the responsibility of maintaining order in the classroom – a task she undertook with the relish of a rather sadistic prison warder. Her fellow-students didn’t seem to particularly mind – after all, it was that time of day when an an afternoon siesta beckoned. However, having spoken to some of the parents, I do know that the issue of absentee-teachers was of concern to them. But what do you do if you’re an Indian fisherman, or agricultural laborer, likely illiterate yourself, and your child’s teacher doesn’t show up? Complaining doesn’t get you far for the very reason that those with any influence have opted out of the system and send their children to fee-paying schools. As I’ve written before, given the failure of the Indian government to properly invest in schools, I don’t blame the middle class for sending their children to private institutions. But it is depressing that the idea of a universal system that properly values the education of all Indian children appears to be of such little concern to those middle and upper class parents whose voices could make a difference.